I started staring at bitcoin charts just over 5 years ago. I’d already spent years staring at all sorts of charts as a derivatives trader so I thought I’d recount to you just why I thought that first bitcoin chart I saw in September 2011 looked so interesting to me. I liked to use Elliott Wave Theory when doing my own technical analysis — the idea that financial charts depict, as fractals, the repetition of humanity’s collective behaviour at any given scale, over any given timeframe. The wisdom and madness of the crowd repeating over and over again. Before I carry on, if you’re not familiar with the basic rules of Elliott Waves, click here for a brief heads up. Also note the final section in that article entitled “Criticism” — with which I absolutely agree. Predicting where the value of an asset sits within an Elliott Wave cycle in mature markets (such as equities, bonds and traditional commodities) can be very difficult indeed, especially where patterns may be taking years or even decades to form. Elliott Waves, more often than not, only become apparent in hindsight but, used correctly, they can be a useful tool to help a trader define their entry and exit points so as to skew risk vs reward in their favour. Hitting the “sweet spot” of certain sub-waves can yield uncannily accurate results but repeated and consistent success in those mature markets is far from guaranteed, if possible at all. However, this post is looking at bitcoin which has provided a much rarer opportunity for us to plot its market-driven value (virtually) since inception. Even most publicly traded companies have a hidden pre-IPO track record. As such, we know exactly where we sit within any possible Elliott Wave cycle(s) as we’re still within touching distance of its very beginning. Since Elliott documented his ideas in the 1930’s, many others have identified similar patterns of repetitive crowd behaviour — whether it be Jean-Paul Rodrigue’s Stages of a Bubble in markets…. …or, technology hype cycles as identified by Gartner. Given that bitcoin is a curious mix of both technology and tradable asset, it’s surely worth taking a look to see if these patterns apply to bitcoin from an Elliott Wave perspective. 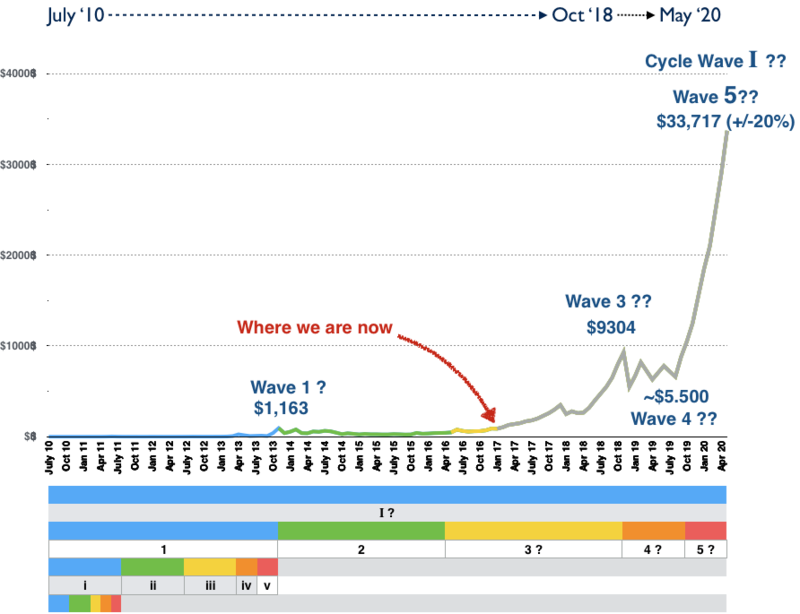 So when I first looked at that bitcoin chart in 2011, I found the textbook “Impulse Wave” that the world’s first digital commodity had plotted during its inaugural bubble routine (between June ’10 and June ’11) somewhat intriguing. The chart below shows the Minor Waves (i), (ii), (iii), (iv) and (v) pattern that, in hindsight, formed a complete and valid Wave i bubble. Note that Wave (v) was by far the longest of the 3 advancing waves — something that has previously been identified as common during physical commodity hype cycles. As I said, 5 very typical Elliott Waves with the table below showing the key peaks and troughs that made up what clearly looked like a bubble given that this market had started trading on Mt Gox at just $0.10 a year earlier. The notion here was that Wave i would itself potentially become the first wave of a subsequent larger (and valid) 5 wave pattern over time. But then, as the chart below shows, the market crashed violently — ultimately giving back some 95% of its gains (with 80–90% being identified by others such as Rodrigue as typical of bubbles) when it eventually made a low some 5 months later when it touched $1.90. This crash, however, was (again in hindsight) simply the start of a Wave ii correction (with Waves iii, iv and v possibly still to come if Elliott’s theory was to prove correct). So, having stared at that chart for some considerable time it made sense to me to look at the relationships in scale between Waves (i) and (iii) and Waves (i) and (iv) during Wave i in order to see what a well formed larger analogue of this initial fractal might look like in terms of future peaks & troughs. So, as highlighted in the table above, Wave (iii) ($8.90) had peaked at 8x Wave (i) ($1.10). And Wave (v) ($31.90) had peaked at 29x Wave (i) ($1.10). perhaps also form a 5 wave triangle that Elliott theorised as the pattern that most commonly formed during fourth wave corrections. Taking all of that into account, the chart below shows roughly what I scribbled down some time in late 2011 as my “prediction” for what, in a perfect world, might be about to pan out in this market over the next couple of years. And then, like any sane person would, I chuckled to myself, screwed it up and threw in in the bin. A 200x return from the current price in 2 years? Yeah, right…. Not that I wasn’t still confident that this initial Elliott Wave pattern could repeat itself at a greater scale. Just surely not that scale! So, after downing a dose of reality, I re-drew the same 5 wave chart but, this time, with a predicted Wave v peaking at a more realistic $100 over the same 2 year timeframe. Still a very high risk long shot but ya never know. The rest, as they say, is history and, as is now clear for all to see, this is what did happen over those next 2 years. Waves i, ii, iii, iv and v themselves forming what I’ve now labelled as the next (larger) Primary Degree Wave 1. Sound familiar? OK, so my timings were a little off. The duration of Waves ii & iii ended up being longer than predicted; Wave’s iv & v shorter than predicted; and the Wave iv correction deeper than my expected (typical) 50% retracement of Wave iii. Even so, the form and price targets had proven to be pretty damn accurate all the same. As noted above, after the June ’11 $31.90 Wave i peak, the market gave back 95% of its gains to make an eventual low at $1.90 in Nov ‘11. Now that you’re probably getting the hang of this, you’ll know that one possible assumption after the Nov ’13 Wave 1 bubble peaked at $1,163 might be, according to Elliott’s theory, that the market would again give back 95% of those gains. As it turns out the Wave 2 correction ultimately gave back a mere 87% when it made a low at $152.40 in January ’15 as shown on the chart below. It was impossible to know for sure that that would mark a significant turning point at the time but, in hindsight, I guess we can say that it was an improvement on 2011! Still, it’s always quite subjective in terms of where one decides to label the endpoint of a correction but by now we did have some clues as to where Wave 2 might have been due to end — around June ’16 as labelled on the chart above (we’ll only ever be sure if this is true in distant hindsight, however). So far I’ve only looked at the amplitudes of the waves so as to identify peaks and troughs. I mentioned earlier that, in terms of trying to predict the durations (or wavelengths) of forthcoming waves, there weren’t really enough previous reference points back in 2011. By now, however, we had a few and so I’ll quickly explain. It took 5 months (after the June ’11 Wave i bubble popped) for the market to hit a low at $1.90. After an initial bounce to ~$7.20 the market settled down and hung around at just under $5.00 until May ’12. It was the break up through that resistance (11 months after the June ’11 peak) that felt significant to me at the time which is why I labelled that as the end of Wave ii. Wave iii then peaked at $259.34 in early April ‘13. So the time between the Wave ii low and the Wave iii peak was ~17 months. Fast forward to the popping of the Nov ’13 bubble peak ($1,163). This time it took 13.5 months to reach what I’ve labelled as the Wave 2 low in Jan ’15 at $152.40 (or 2.7x the 5 months it took for Wave ii to make its low). So let’s use the factor of 2.7 to look at future wavelengths (durations). If Wave ii lasted 11 months, perhaps Wave 2 would last 30 months (11 x 2.7). That would take us from the late Nov ’13 peak through to June ’16. As it turned out, the period between Nov ’13 to the Wave 2 low in Jan ’15 and then through to June ’16 displayed similar price action to that which occurred during Wave ii between June ’11 and May ’12 — i.e an initial strong bounce from the low point (this time to ~$500 then consolidating at ~$400) before breaking out to the upside just before the 2016 block reward halving in July ‘16. It’s certainly slightly arbitrary but it’s the only clue we have so the table below shows what that 2.7 factor might tell us about any forthcoming wavelengths and the timings of future peaks for this current Primary Degree Cycle. We’ll come back to this later…. However, as we now start to flirt with the Wave 1 high (in USD terms at least — most other currencies have already exceeded it) we can begin to postulate that Wave 3 might have started in June ’16 on its merry march upwards (although we’d want to see that old high surpassed as an initial confirmation). Note for reference that, when each of the Wave (i) and Wave i peaks were subsequently breached, those prices were never touched again. Only time will tell if a breach of the Wave 1 peak delivers a similar result. And here’s what a bitcoin chart looked like just before we breached the Wave i peak in late Feb ‘13. Edit: Writing this post whilst the bitcoin price has been so volatile this week ain’t easy! As of this morning (6th Jan) we’ve had a very strong two day sell off when the market failed to take out the previous $1163 high. We saw very similar price action in Feb ’13 as the market got back to within a whisker of its 2011 all time high at $31.90 before correcting sharply but then taking it out at a second attempt. Now, finally, let’s get to the crux of what this (hopefully not too) rambling post might tell us about bitcoin’s next bubble — IF that bubble materialises at all. Of course, the correlations I’ve highlighted may have just been pure coincidence. Furthermore, without that original scribbled chart to validate my 2011 thoughts it’s tough for me to prove to you that I’m not simply surmising this analysis in retrospect. No matter really as the resulting numbers are there in black and white and you can click here to get a hint at my previous thinking in my last post on the subject in May ‘13. Bitcoin may well survive and grow and, indeed, continue plotting valid Elliott Wave forms that bear little resemblance to the two I’ve identified here. There is, of course, no guarantee that those patterns will repeat again at a grander scale — remember that during bubbles #1 and #2, and unlike today, there was virtually no capacity to short the market at any of the exchanges to exert any counter pressure as the bulls ran wild. Also, bitcoin’s ongoing and unresolved scaling issues have so far been left at the door in this recent run up and the outcome of that remains to be seen. And, without doubt, bitcoin could still just as easily crash and burn as has been predicted 119 times already — consigned to history along with this post. But, just for laughs, and so you can get back to doing something useful, let’s stick with it and see what those previous peaks and troughs might just predict today. As I’m sure you’ve now guessed, the maths are quite simple. In short, we’re simply looking for another larger fractal of our original Waves (i), (ii), (iii), (iv) and (v) that formed the original 2010–11 bubble. Our eventual Wave 1 peaked at (an almost exact 3 orders of magnitude greater) $1,163. So will our forthcoming (?) Waves 3, 4, and 5 simply also be 3 orders of magnitude greater in scale than Waves (i), (ii), (iii), (iv) and (v) and will the wavelengths I projected earlier be relevant too? The previous peaks gave us an almost exact prediction of Wave iii reaching ~$255 whilst giving us a 20% overshoot on on the predicted $925 target when Wave v peaked at $1,163. As before, a target for Wave 3 could be 8x Wave 1. And Wave 5 might again, look to reach a price at 29x Wave 1. And, finally, in between those two advancing waves we might again see a Wave 4 correction, that, if analogous to Wave i in 2011, corrects back down to around $5,500, possibly by forming yet another 5 wave triangle pattern, before a subsequent Wave 5 mania begins. And that, intrepid reader, would complete our new Cycle Degree Wave I before — you guessed it — crashing again, giving back 80–90% of its gains as we progress through Cycle Degree Waves II, III, IV and V over the course of many, many years as wavelengths broaden whilst amplitudes increase in size. Do I think that sounds ridiculous? Of course. Bubbles and hype-cycles always are (in hindsight). If it ever gets to that stage the market will no doubt begin to behave much like any other maturing market with far more outside (and inside) influences to truly reflect “the crowd” with predictions becoming harder and harder. These are only the opinions of the author and do not constitute investment advice. Only invest what you can afford to lose as your investments can go down as well as up (or more often than not, down as well as down). Formerly a derivatives trader for 20 years, I’ve been organising the UK’s largest bitcoin/blockchain meetup group, Coinscrum, since 2012.